Hello Samurai! I have a GE side x side fridge that is driving me crazy. Started not cooling correctly, nothing freezing on the freezer side. Repair guy replaced main board. He said the coils were only icing up to about the 3rd coil. Main board didn’t fix the problem, he came back out and charged the system with freon. That seemed to work for a week but the defrost cycle would still cause all ice in freezer to melt. But at least I was still happy that fridge was getting cold. Then, freezer stopped getting cold again. I changed the 2 thermistors in the freezer last night, pulled plug and let sit for 15 minutes. Turned back on and same thing. The first 2 or 3 coils start getting iced up and then defrost comes on and melts. Even if the defrost doesn’t come on it seems like the coils will not ice up. Any ideas on this one? If the evaporator coils– the coils in the freezer behind the inside back panel– were only partially frosted as you describe, this is a clear indication of a sealed system problem. If the unit was really low on refrigerant, which seems like it may have been the case based on the short-lived improved temperatures, then it would have gotten that way due to a leak in the refrigerant tubing somewhere. So, simply adding more refrigerant is not repairing the problem at all and, in fact, is illegal under EPA regulations. It is illegal to simply add refrigerant to a refrigeration system that has leaked without locating and repairing the source of the leak because the refrigerant will simply leak back out into the environment. The correct procedure would have been to locate the source of the leak using various techniques, repair the leak, pull a deep vacuum on the system and then recharge it with the correct refrigerant in the amount specified on the model number tag. Now you see why I said that the expense of doing sealed system work correctly (and legally) usually doesn’t make sense for most home refrigerators unless it’s a built-in unit, like a Sub-Zero, where you paid so much that you’re married to it. For most other types of home refrigerators, if there’s a sealed system problem, that’s usually a terminal event and it’s time to go shopping. If a real Master Appliantologist were on the job and saw the deficient frost pattern on the evaporator coils, he would first verify that the condenser fan was running at full speed and that the condenser was clean. If both of those things were true, he would have recommended that you junk that box and go buy a new one, no muthaboard, no “recharge.” The only expense would have been the basic service call fee. 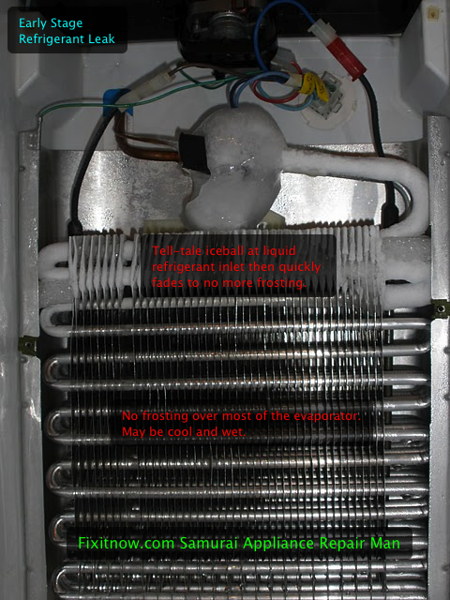 This entry was posted in Refrigerator Repair on June 28, 2011 by Samurai Appliance Repair Man.